A divorced couple attempt to steal a diamond from a ruthless businessman. Richard (Brosnan) is on the cusp of retirement when he arrives at his company one morning to find it bought out by a ruthless Paris based businessman. With not just his retirement fund, but the livelihoods of his family and employees destroyed, Richard consults his ex-wife Kate (Thompson) for guidance. The two come with a hare-brained scheme to steal an expensive diamond from said businessman and head off to Paris with neighbors Jerry (Spall) and Penelope (Imrie) in tow. In the seventies, the British film industry was at its lowest ever ebb. The names of Lean, Powell and Reed were rapidly fading into history and Hammer studios, having made their name with gothic masterpieces like The Curse of Frankenstein and Dracula, were reduced to producing big screen adaptations of the very much of its time sitcom On the Buses. A raft of sitcom adaptations followed and they usually stuck to the template of Holiday On the Buses, sending the cast off on a foreign holiday, proving ample opportunity for Little Englanders to make quasi-racist jokes at the expense of their European neighbors. Today, UK cinema is rapidly heading back to those dark days, resorting to bringing TV shows like The Inbetweeners and Alan Partridge to the big screen. The former was quite the throwback, sending its characters off on a foreign holiday. The biggest recent trend of UK film is of course the series of movies aimed at cashing in on the "grey pound". Movies like Le Weekend and The Best Exotic Marigold Hotel have taken aging Little Englanders and sent them to foreign climes where they can rediscover themselves while patronizing the locals. 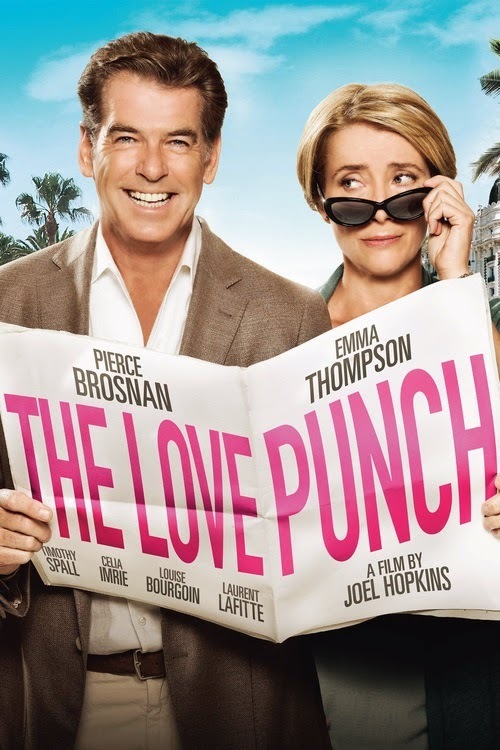 The Love Punch is the latest to follow this annoying and highly cynical trend but its leads, Brosnan and Thompson, are an ill fit for this material. It's difficult to buy such a glamorous pair constantly making jokes about arthritis and their inability to stop dozing off in the middle of the afternoon. Thompson is, after all, a mere three years older than Tom Cruise, while Brosnan is a year younger than Hollywood's current hottest action star, his compatriot Liam Neeson. They are, of course, a pair of talented comic actors who could do this sort of schtick with their eyes closed, but the script is so painfully unfunny I imagine they must have had their eyes closed while reading it. Hopkins' idea of grand comedy is to have his "elderly" cast walk in slow motion with hard rock playing on the soundtrack, only to interrupt the scene with a record scratch and a character complaining about their weak bladder. Oh how we laughed. Actually, we didn't laugh. I can't recall a comedy screening as quiet as the one held for this. The atmosphere among the assembled critics was positively funereal and I counted more laughs at the 12 Years a Slave press screening than this one. Brosnan and Thompson turned out quality work last year in Love is All You Need and Saving Mr Banks respectively, which makes it all the more irritating that they should settle for utter tosh like this.